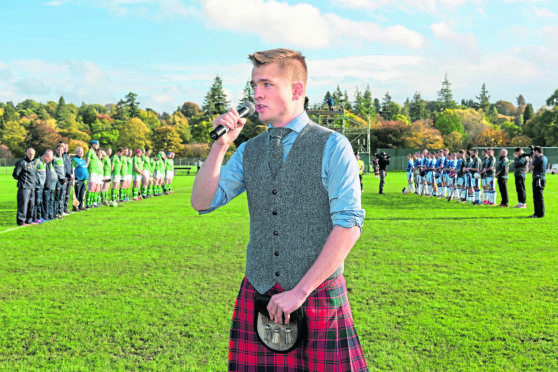 Robert Robertson singing the national anthem at last years Marine Harvest Shinty/Hurling international. Scotland v Ireland Shinty / Hurling International played at The Bught, Inverness. The governing body of shinty marks its 125th anniversary in October. And in celebration of the news, the Camanachd Association is planning a series of events this year. An anniversary conference is taking place in partnership with the Highland Folk Museum in Newtonmore on October 10 which will examine and celebrate the past, the present and the future of shinty. That evening in the Badenoch Centre, Kingussie, will be the final performance of Shinty’s Heroes, a much-acclaimed musical audio-visual concert commemorating the impact of World War I on shinty communities. Hugh Dan MacLennan and Gary Innes will present the performance, which also looks at the development of the game over the last 125 years. A big day of shinty takes place in Glasgow on Sunday, August 5 with a ceilidh and come and try events. The “Caman” Back to Shinty will be a week-long celebration of the sport from October 6 to 13, inviting all clubs and associations to engage their wider community and encourage more people from local communities to get involved in shinty. And the most coveted cup competition in shinty will take place on Saturday September 15 at Mossfield, Oban and will launch with the Camanachd Cup visiting a number of local clubs and schools. The highlight of the women’s shinty calendar sees the Marine Harvest Valerie Fraser Women’s Camanachd Cup played for the 16th time this year at the Dell in Kingussie on Saturday, September 1. There are many more events and celebrations taking place throughout the year including the Marine Harvest Shinty/Hurling Scotland v Ireland International at Bught Park in Inverness on October 20. This year’s event brings the senior male and female teams to one venue for a festival of shinty. A 125th anniversary logo has been chosen after a competition, which attracted hundreds of entries, was won by primary seven student John Robert Chisholm of Leverhulme Memorial School, Harris. Keith Loades, president of the Camanachd Association, said: “The last quarter of a century has seen arguably some of the most dramatic changes in our organisation and we do not often have the chance to reflect on that.